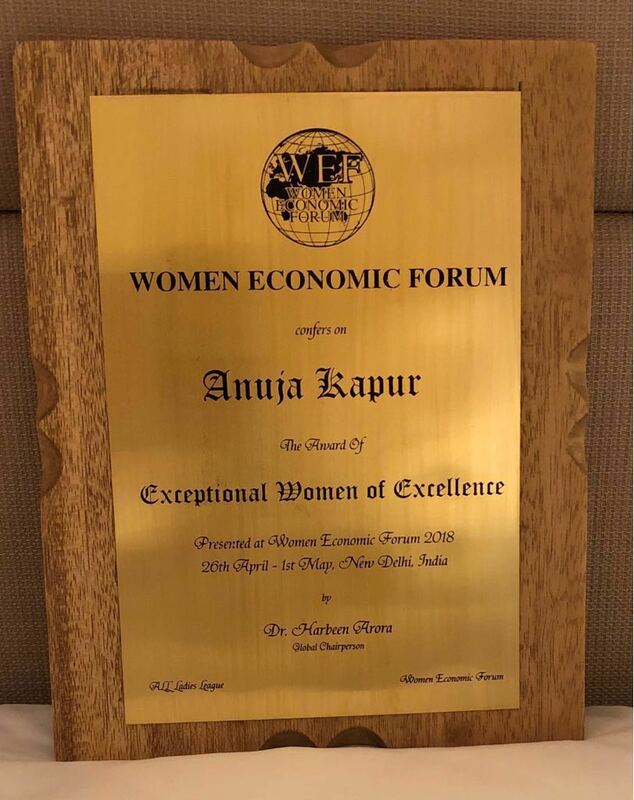 Adding another feather to her cap Ms. Anuja Kapur famous criminal psychologist was awarded as“Exceptional Women of Excellence” at Annual Edition of Women Economic Forum (WEF) 2018 held at Hotel Taj Dwarka. At the event Mrs. Anuja delivered session on how to find and build your passion which left everyone in awe with her mesmerized words. She quoted "First things first in order to realise and build on your passion you need to think out of the box and not follow the herd. You can develop it by getting out of your comfort zone and look into various options. The best possible way to build on your passion is self analysis. It is an individualised representation of your goals and the future you visualise for yourself. Doing a best possible self exercise can help you gain better insight into your goals, activities and motivations. Processing your passion is part of an active process to become a more persuasive and affective person. This is where you can start creating a platform to your passion and getting around with it. To strengthen on your passion is when you have established something from within that seems natural, pleasurable and valuable doing. A positive attitude in life will also assist you in coping easily with your goals and passion irrespective of your age and gender. If you are still troubled and have failed to identify and build on your passions and goals, you can always reach out to a mentor or a leader in your life. A positive mentor(parents, friend, teacher or a guardian)is the perfect person who can offer you advice or counselling towards your passion. " In another session on what keeps you awake at night, she quoted "My passion in life is what keeps me going all day and night. Passion is when you see and feel your goal on your own terms. Associate with your life, mingle yourself with masses who inspire you to develop in a positive form and be mindful of the opportunities to grab them as and when they present themselves. If you follow and explore these that pique your interest, you may soon find yourself awake in the wee hours of night, as your are being driven by your passion. A positive attitude will make you an optimist and would bring constructive changes into your life. When the world is against you and criticizing you that is a sign you are on the right track. When others start getting envious of you doing something effortlessly, their resentment is a hint enough to help you realise that you have found your passion. " In the words of Mrs Anuja Kapur “Women Empowerment is about giving women the authority and power to pursue what they want in life, Women Empowerment is about letting women be fortified and confident and lastly Women Empowerment is making the women aware of their rights and privileges.” Women employees should be given breathing space in their workplace and also allowed special work conditions under maternal and family needs. Equal opportunities should be made available to women. Personnel should be picked based on their capabilities and not on their gender. 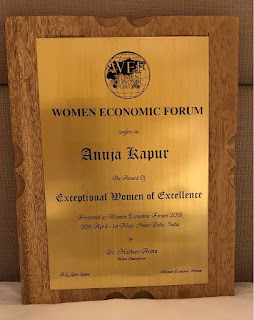 Mrs Anuja Kapur in the end thanked the congregation of Women Economic Forum for honouring her with such an auspicious award and also discussed about women empowerment. She stated that Women empowerment starts when a child is born. If the mother is empowered she can further empower her children it is like a positive ongoing cycle. The event was attended by more than 400 speakers from 80 countries comprising businesswomen, entrepreneurs, educators, engineers, innovators, media leaders, and of course dignitaries from across the world.